Foothills Brewing is bringing 13 North Carolina breweries together for the second annual Hop Swap Half Marathon/5K to kick of NC Beer Month and generate awareness for its race charity Yadkin Riverkeeper. It's going down this Saturday, March 31 at Foothills Brewpub in downtown Winston-Salem, North Carolina. And it's a great time of year to visit Foothills Brewing— the only time of year, in fact, when the brewpub serves beer on draft from other breweries. From the Triad pouring beers are Foothills, Brown Truck, Four Saints, Joymongers, Preyer, Natty Greene’s, Hoots, Fiddlin’ Fish, and Wise Man. "Two of our favorites from Charlotte are also coming – Wooden Robot and Legion," says Foothills Marketing Director and HopSwap initiator Ray Goodrich. Koi Pond is coming from Rocky Mount – as is Quest, all the way from Greenville South Carolina." Foothills intentionally chooses Hop Swap breweries based on their size (they like to support brands much smaller than their own), and the great beer that they're brewing. 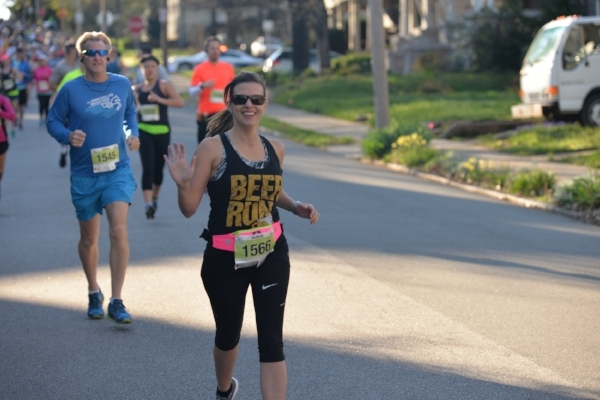 This event gives Foothills, some of NC's most fervent craft beer crusaders, and excuse to enjoy their friends' beers in great company— after the race and beyond. Read more about Hop Swap in this Foothills blog post. It was North Carolina's breweries who first inspired the Coopetition Beer Blog, and they continue to give us reasons to write about the incredible camaraderie that abounds in the craft beer community. Cheers to the State of Southern Beer!